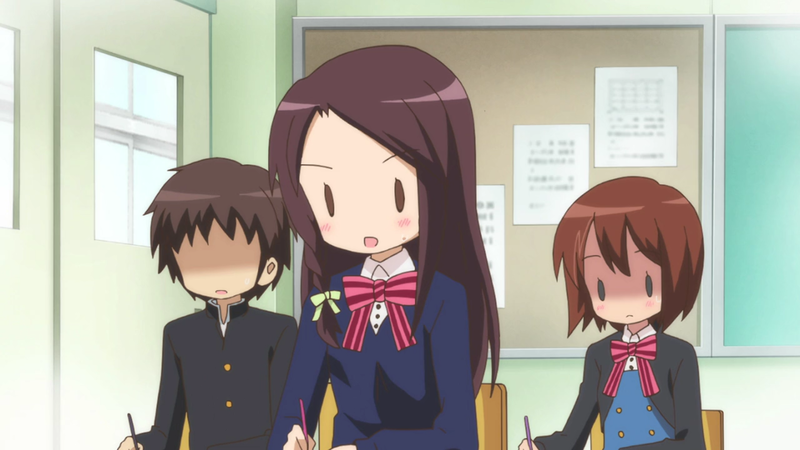 Kin-iro Mosaic – 07 | Mezashite! Best girl, by the way. Amazingly not terribly delayed despite oceans and silent auctions getting in our way. Apparently イギリス is strictly “United Kingdom” and イングランド is England, so we should’ve been using UK and British instead of England and English the whole time. 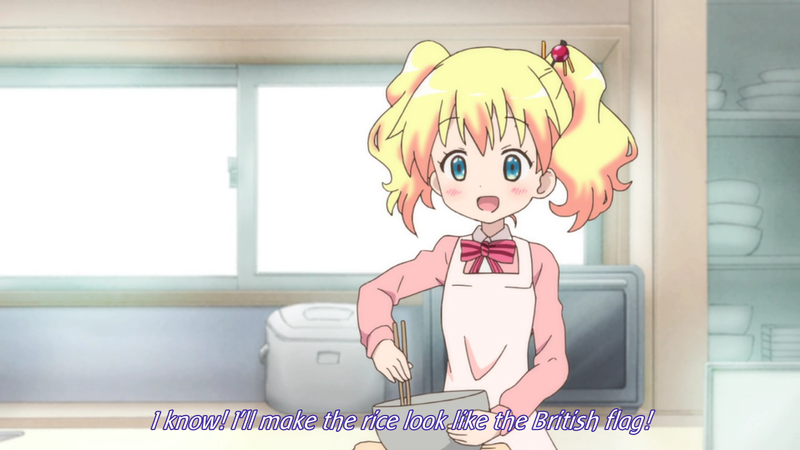 Which is weird, because イギリス is derived from the Portugese Ingles (or something like that), which is way closer to the Portuguese word for England than to the Portuguese word for the UK. And it’s not like anyone but the British really cares about the difference… right? We decided that the slangy and not-obviously-understood-by-a-foreigner (in the sense that Alice, having learned her Japanese in a formal setting, doesn’t know what it means) aspect of ヤバス (yabasu) was more important than the I’m-gonna-die-now aspect of it. And the kind of people who say ヤバス kinda feel like the same kind of people who would say FML in English. 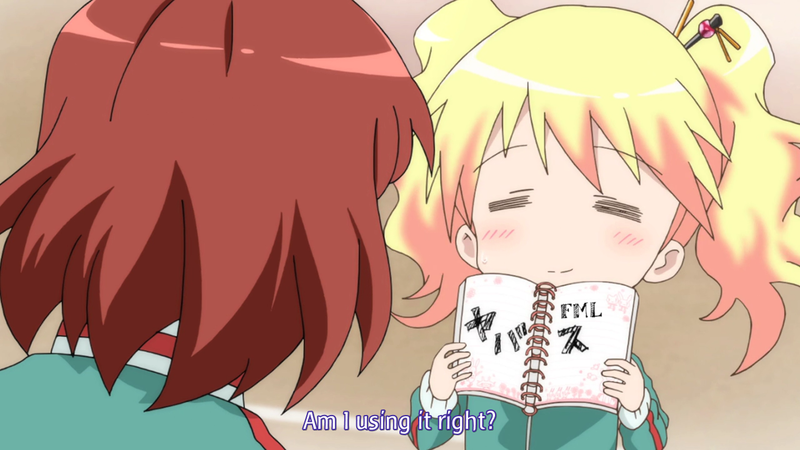 This entry was posted in Kin-iro Mosaic by Etoce. Bookmark the permalink. Thank you for all you do, it’s appreciated. The one thing in this episode that made me scratch my head a bit was the use of ‘FML’ for ヤバス – ‘fearing’ for your life/safety is quite a bit different from complaining/whining about it (though I’ll admit I’m not sure what a better option would be, I was somewhat hoping for a TL note on that to get an idea of what the thought process was). Then again I could very well be completely misinterpreting the context of the terms; in any case, it’s only my opinion. A big part of the lack of TL notes for this episode was that I was tired and wanted to go to sleep, actually. I put up a TL note about it, but I don’t know how much it’ll help — essentially we prioritized the kind of word it was over its precise meaning. Thank you very much for the response and for adding the note; usually I don’t say anything about a translator’s choice of phrasing, especially in obscure or difficult situations, but for whatever reason this one bothered me, but now I see where you were coming from. Thank you and once again, keep up the good work, I really appreciate the dedication you put into your releases! Thank you very much for the release. I was kinda surprised that youused the FML but I still think that it is fine nevertheless .